Will mobilize the youth in my community and try getting a possible solution for the drainage problem we face today, because it’s a big pull back in our community in terms of movement and infrastructure. Am proud of my country, apart from being the newest nation in the world we also have diverse cultures that I would like the world to see. At this tender age I clearly remember being in Yirol town in Lake State South Sudan where I went to Holy Cross Primary School and every evening I would go back home and help with the house chores. I later travelled to Uganda when I was 15years old where I pursued my high school education at Lake Side Secondary School and later travelled back to Juba, South Sudan for completion of my university course, Education in Public Relations. In my growing up years I have come to learn that working hard always pays and I remember when I was young my mother used to tell me that I shouldn’t bad mouth people or even gossip about anyone. I still do remember all the advices my mum used to give me and I do treasure them a lot. 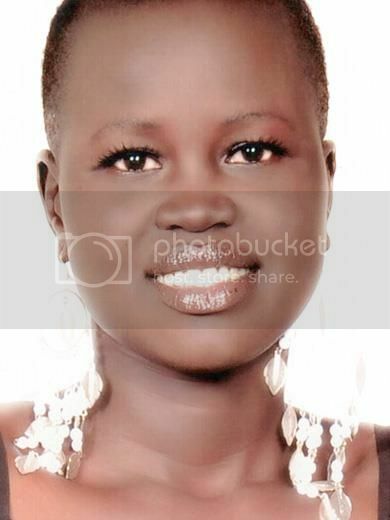 It was in 2010-2011 when I held the Miss South Sudan crown. At first it was so overwhelming but I got used to it. It was a great moment that I will always treasure in my life. I chose to work on the drainage system issue in my country because it has really messed up the bridges that act as a link between many communities in South Sudan, thus rendering poor trade activities and causing an increased poverty rate. I would proudly tip anyone to practice use of solar energy since there is no sustainable geothermal energy at our disposal currently. I would like to thank the whole management for giving me a chance to be a part of all this and I hope for the best outcome for me and all my other colleagues. God Bless.